January 2013 – Hurley Books – How do you do? A confident, new gritty noir thriller based in gangland Glasgow. 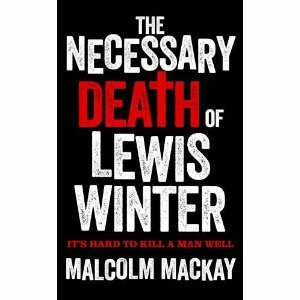 Callum is a hitman and has been hired to kill Lewis Winter, all he knows is that it will send out a message to someone. The problem is that the people who have hired Callum also don’t know who the message is for. Poor Lewis Winter is simply the first shot across the bows to persons unknown who are trying to muscle in on territory. The story unfolds simply and quickly. MacKay’s writing style is brief, fluid and fresh and it gives us little more than pencil sketches of personalities and plot. However, it all starts to interweave building up a story far greater than simple stereotypes suggest. I was surprised by how much I enjoyed it, given that a gang land novel just didn’t appeal but then good writing can make anything interesting! Try it for yourself. It looks as if our website has been causing confusion so I’ve given it a few tweaks and whilst I’m at it I may as well remind everyone what we’re about. We are a second hand bookshop. We also sell books online. We also have a sibling called The Cornish Bookshop. In our bricks and mortar shop you can find a wide range of good quality second hand books. Occasionally we carry some new titles (Harry Potter for example) and we have a small selection of new Cornish titles. Customers will sometimes ask us to order books for them, we will search for the cheapest and quickest that we can find. Often this means we use Amazon. By and large our customers understand this and aren’t bothered. Those that don’t like Amazon ask us not to order from them and we don’t. We have lots of local and national wholesalers who we support but generally only for bulk orders, our discounts with them are low as we are a second hand book shop and don’t place enough large orders with them, which is understandable. The books we sell online are on Amazon, eBay, ABE and Alibris and stored in our warehouse. We don’t handle these sales directly as we couldn’t afford the fees for hosting our own site. Plus not enough people would visit our personal site to make it worthwhile. After all what are the chances that we will have the second hand copy of the book that you are looking for? We have set up The Cornish Bookshop as a specialist site to help authors and publishers find an outlet for their books that doesn’t cost them the earth. Amazon demand around 60% discount from the author / publisher to stock their titles which is really harsh, especially when we are talking about low print runs and small profit margins. The Cornish Bookshop as well as having its own site is also on the Amazon market place. Confusing? Not really. What it means is that for a small commission we get to sell these specialist titles to an enormous audience and the authors don’t have to pay the 60% fees. (You see there’s a lot going on behind the scenes). We have a website (you’re on it) where we just like to pull all the strands together. You can see the books we have in the warehouse if you go to our eBay home. On the Amazon link you can shop to your heart’s content and we receive a little commission so you are still helping a local independent bookshop. Or you can browse our Cornish titles and support the local economy. Finally you can flip over to our Facebook page and see what’s happening in the bricks and mortar shop. Our views on Amazon. We understand that people want to support local bookshops and we love you for it but we do get surprised when sometimes people expect us to hate Amazon. We’re all booksellers and just because they do it better than us doesn’t mean that we’re going to snub them (let’s leave the tax issues to one side for now). What Amazon can’t do as well as us is offer a friendly informal chat but honestly people don’t value that so much and that’s OK we know the market that we’re working in. Our views on Kindle et al. Well, this is a whole new ball game. As a bookseller I’m pretty much out of the loop because of the directness of the download. I can live with that, the market for physical books is going to get smaller and tougher but Hurley Books is fine. After all we’re second hand and specialist Cornish. We’ll be around for a long time yet! So that’s us and I hope that makes sense.